Whether you enjoyed the movie or it gave you a Michael Bay-ian headache, it does seem a little strange that Transformers: Age of Extinction doesn't have a set of trading cards. Well, that's not entirely true. It doesn't have a North American set. 2014 Topps UK Transformers Collector Cards are aimed at European audiences. Rather than just covering the fourth film, it covers all of them. 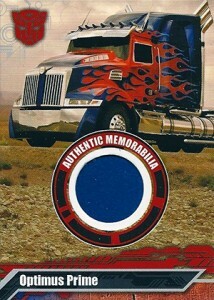 Among the cards is a rather curious memorabilia card featuring sheet metal from Autobot leader Optimus Prime. 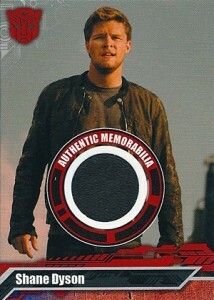 It's one of five memorabilia cards in the product. Others include costume swatches from Mark Wahlberg (Cade Yeager), Nicola Peltz (Tessa Yeager) and Shane Dyson (Jack Reynor). There's also a second Optimus Prime card with a piece of his real tail light panel. All of the 2014 Topps UK Transformers Collector Cards memorabilia cards are serial numbered. The main Optimus Prime card is, by far, the most plentiful with 8,070 copies. Wahlberg and Reynor are numbered to 1195 while Peltz is limited to 555 copies. The tail light Optimus Prime is even rarer than Peltz, although we weren't able to find the exact print run at the time of this article. Because of the European distribution, North American collectors are largely reliant on eBay to find them. But they're not the easiest to find either. 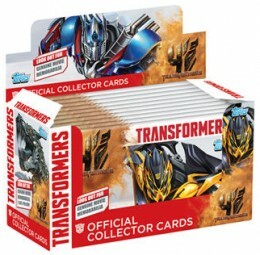 Besides the five memorabilia cards, 2014 Topps UK Transformers Collector Cards have 150 base cards and 20 foil cards. Foils are numbered 151-170, which makes them part of the main set. 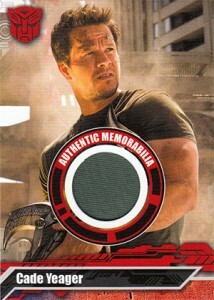 This isn't the first time Transformers memorabilia cards have been released. 2007 Topps Transformers has a pair of easy-to-find and very generic SOCCENT Solidier relics. 2013 Breygent Transformers Optimum Collection has three more uniform cards and a pair of prop cards with Ironhide tire pieces. 2016 BATES MOTEL COSTUME CARD: NICOLA PELTZ #CNP2 "TRANSFORMERS LAST AIRBENDER"
2016 BATES MOTEL DUAL COSTUME CARD: NICOLA PELTZ - "TRANSFORMERS LAST AIRBENDER"